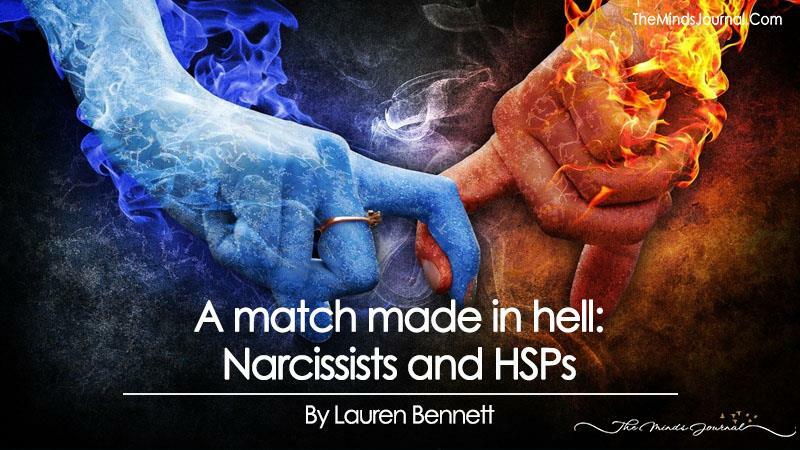 Two of the hottest psychological topics on the Internet right now address two personality types that are virtually on opposite ends of the behavioral spectrum: narcissism/psychopathy (or more specifically, NPD), and HSPs (highly sensitive people). I think there’s some significance to this. For reasons no one seems to understand, Highly Sensitive People seem to be thrown together with Narcissists more than you would expect by chance alone. Neither personality type is especially common: people with Malignant Narcissism (NPD) comprise approximately 4% of the population in the United States; HSPs comprise about 20% making them somewhat more common–though they may seem less common than they really are because they’re often hiding in the shadows and rarely call attention to themselves. Many HSP persons have learned to stuff their sensitivity and emotions because (besides having been shamed for it), high sensitivity doesn’t work very well in the narcissistic and materialistic society we are currently living in–a society where qualities like aggression, social gregariousness, bluntness, impatience, and indifference to the suffering of others are far more valued than qualities like civility, deference, intuition, shyness, and empathy. Aggression and gregariousness are especially valued in the worlds of business and politics. Face it, you’re not going to find a great job (or any job at all) if you call attention to the second group of qualities and may well be regarded as weak and ineffective. Politicians who appear too empathetic, tolerant, gentle or soft-spoken rarely win elections. That’s why liberals keep losing elections. It’s my observation that those with more liberal ideologies are usually better educated, but also by nature are more empathetic and care more about the plight of the less fortunate. Let’s face it: narcissism wins elections, and that’s why the country’s in such a huge mess. But this isn’t about politics, and I don’t care what your ideology is. I don’t want to stereotype political ideologies based on personality because there are conservatives who are also sensitive and liberals who are anything but. I’m referring more to the people in powerful political positions, not the people who vote for them. Highly Sensitive People have a number of characteristics that make them vulnerable, especially to people with NPD, and all too often HSPs find themselves either being raised by psychopaths or married or otherwise in serious relationships or friendships with them. 1. You were bullied in school; the bullying may have become a pattern throughout your entire schooling. Maybe even as an adult, people like to “mess with you” to see if they can get a rise out of you. 2. You had imaginary friends or spent a lot of time in “imaginary worlds” of your own making, or you were often accused of daydreaming by your teachers. 3. As a child and perhaps later into the life you cried easily and often. You may have been a “difficult” or sickly baby or toddler. HSPs do seem more prone to serious allergies and childhood illnesses more than other people. 4. You never were “popular” but prefer to have deep friendships with one or two like-minded people who may also be HSPs. 'Hear No Evil Speak No Evil' by Shadow Mario on Deviantart For a long time I thought I suffered from The Trifecta of Victimhood (largely brought on by my lifetime of living as prey in a jungle of predatory narcissism): Borderline Personality Disorder (BPD), Avoidant Personality Disorder (AvPD) and Aspergers Syndrome. Try living with that combination. Never a dull moment, but I wouldn't wish it on my worst enemy. It's still better than being a Narc. [my thoughts on that last remark after my dive down the rabbit hole: HAHAHAHAHA! LMAO! Why the laughter? Because for awhile, from about August 2015 through December I was absolutely convinced I was really a Covert Narcissist. It's very confusing, but thank God I'm not one. My therapist doesn't?t think I do, but Complex PTSD, BPD, and Avoidant PD together can look an awful lot like Covert Narcissism. I also suffer from Seasonal Affective Disorder (fall/winter type) and was recently given a new diagnosis of C-PTSD (replacing the BPD). Living with Abuse: Why Didn’t I Ask for Help?